Aspen Youth Center, Aspen, for $1,000. A free six-week summer STEM program with a focus on computer science, coding and robotics. This program will help children explore STEM fields outside of school so they can pursue their interests and be better prepared for the future. Funds will be used to purchase Raspberry Pi’s for eight kids, six brush bot robotics kits, six art bot robotics kits and three x 4-in-1 robots that follow black lines, motion, light, or touch. Family Visitor Program of Garfield County, DBA Family Visitor Program, Glenwood Springs, for $2,000. An in-home “Read to Me” program promoting pre-literacy skills. Children will receive an age appropriate board book and parents will learn age appropriate techniques for reading to their babies. These funds will serve around 65 families through book purchases. Previous funding for these needed book purchases is no longer available. A program in which students aged K-5 receive daily intensive intervention for reading. Funds will be used to provide books to take home each month that are culturally relevant and expose students to rich language. Follow-up will occur as parents participate in a monthly meeting or through phone calls that encourage intentional conversation about the books. Vocabulary from each month’s book will be incorporated into instruction to help parents understand the words and use them effectively at home. This is a journalism program that produces a school newspaper, yearbook and poetry journal. More than 70 students participate in the program annually. Funds will be matched and will pay for graphic design, print costs, supplies and curriculum. The programs will provide students with an opportunity to practice literacy in a variety of domains. Yampah Mountain High is an alternative high school that serves 65% of its students a free or reduced price lunch. Funds will be used for the purchase of reading intervention materials that target K-3 readers with phonics deficits, which are preventing them from reading grade level texts. Two scientific, research-based programs from Really Great Reading will be used to provide explicit, systematic and multi-sensory phonics instruction in small, targeted, daily intervention reading groups. In addition to purchasing two intervention programs funds will be used to purchase bags so that students can take books and materials home and back to school. A classroom set of Vex Robotics along with supplemental research-based curriculum designed specifically for a high school classroom. Supporting existing state and national science standards, students will construct and use robotics and computer programming to explore current issues, model real world applications and propose solutions to questions that face the community. The strategy is a Project-Based-Learning approach to curricula with student engagement through engineering design and problem solving. For extensions to a dog-book library, bookmarks picturing the dogs and incorporation of new volunteer teams in the Reading Education Assistance Dogs (READ) program. The Therapy Dog teams visit six elementary schools and three libraries in Summit County to help children build their reading comprehension and self-confidence. Approximately 340 children will have a reading experience through this program. Having multiple books along helps them assure that children have a book at the right level so they can have a successful reading session. Funds are for a Summer Reading program that will focus on middle school and high school students. Working with the theme “All That Jazz,” teens will be encouraged to participate in the library community through activities to get the creative juices flowing, learning new skills and accessing books and reading ideas. The theme of the Collaborative Summer Reading Program is “Libraries Rock.” The grant will provide materials for programs and pay instructors who will lead the effort by making musical instruments out of everyday stuff and writing novels. Framing Your Thoughts curriculum to be used for students who struggle with literacy – often those with dyslexia. This is a systematic writing curriculum that uses color-coding and movement to help teach writing. Using a free instructional webinar all teachers will be trained and the curriculum will be used across the school. Funds will purchase practice books, a sentence structure guide and other supporting materials to serve roughly 340 children. Purchase of items for an Early Intervention Program to help develop speech and language skills for children with intellectual or developmental delays or disabilities for birth to three years old. This project focuses on the foundation of literacy for children with social-emotional and sensory processing issues. Funds will purchase puzzles, books, games and paints along with a weighted compression vest and lap pad. Forty-seven students in the community will benefit from the program. For integration of Lexia Core 5 into fourth and fifth grade classrooms. Funds will purchase licenses to the Lexia curriculum. Hayden Valley Elementary is on an Improvement Plan due to insufficient academic proficiency. Students face a high rate of financial distress in their community. This program will build on the use of this engaging and individualized program already occurring in grades K-3. Teachers will be notified by Lexia when students need support or interventions with specific concepts. This program also allows students to log in at home, the library and even during holiday and summer breaks. For a project that will allow students who are struggling and reluctant readers to successfully understand difficult science concepts. Funds will purchase multiple copies of “Science Comics” and “Max Axiom Science Comics” that correlate to learning goals in Grade 3-5 classrooms. Students who struggle as readers will now have access to science content using a student-friendly, high-interest, low readability resource. The Grant funds will be used to transform the school library into a Makerspace. Kits will be created that fit in bins for easy set-up and cleanup not only in the library but also in classrooms. Funds will be used to purchase Snap Circuits, Little Bits Electronic modules, LEGOs, K’nex kits and more. This International Baccalaureate accredited school serves over 500 students. An 8-week collaborative science project based on the novel “The Martian.” Students will be divided into teams and tasked to determine the best location for the first Martian research station. They will have five weeks to prepare for their mission, learn the protocol for their data, and read “The Martian” by Andy Weir. They will have one and a half days on Mars (Estes Park) to identify their location and gather the required information. Additionally, they will have to grow some of their own food for the trip (potatoes). Funds will be used to purchase books and lab tools and pay for part of the overnight trip. Science in Nature camps are week-long summer research programs for 5th-8th grade students that help them see themselves as scientists. The focus will be to support these young scientists in developing analytic leadership and character skills that allows them to explore nature and the world through scientific literacy. Funds will be used to purchase activity materials, fund facilitators and provide food for the camps, which will promote teambuilding, problem solving and development of scientific inquiry skills focused around the Cache La Poudre River. Funds to purchase the Santillana USA Guided Reading Library for grades 4-5. They’ll be used as part of this Title 1 school’s Drop Everything And Read (DEAR) program by providing more relevant and interesting selections for students and in partnership with an after school literacy tutoring program. After school literacy tutoring for students who need additional attention has been added. Here, 86% of the schools students are on a free or reduced lunch program. For purchase of kitchen equipment, trips focused on learning to read restaurant menus and grocery store shopping labels in addition to participating in other local community events. Adaptive equipment will be purchased as well. This is all part of the school’s Kitchen Science project which is geared to help students with significant learning needs gain skills needed to be successful in post-high school training and the work force. Creation of a library of science books that can be checked out and used to supplement other materials and to help support and solidify student learning. Books have been chosen for their correlation with the NGSS science standards. This program has the goal of increasing science scores in a Title 1 school where 100% of students receive free breakfast and lunch every day. Last year only 20% of the students were proficient in the NGSS science standards. A project that enhances the early learning environment of underprivileged students by providing materials and experiences that build upon their natural inclination to explore, build and question. Funds will purchase materials and storage for use in the classroom and for a visit to the Terry Lee Wells Discovery Museum. An inquiry-based approach will help four and five year olds see themselves as scientists and consumers of science. In-class robotics and coding lessons for pre-K through fifth grade students. Funds wills be used to purchase LEGO MINDSTORMS robot kits and books along with Fisher Price Code-a-Pillar sets and extensions. A STEM Coach will also provide an opportunity for interested students to participate in an afterschool Coding and Robotics Club and demonstrate their robotics and coding skills for their families. Mark Twain is a Title 1 school with a 100% free breakfast and lunch program. Grant money will be used for the “Libraries Rock” Summer Reading Outreach Program at the Fallon Youth Club, Churchill SumFun and at NAS Fallon Child and Youth Programs. Weekly visits to these organizations will include time to read stories, provide books to take home and stamp a book log. Children will also get to know Library employees and feel more comfortable going to visit the library. More than 200 children ages 3-14 will be served through this collaborative effort. A weekly activity in the Churchill County Museum’s “Discovery Room” to help children Discover, Educate, Create and Communicate. Monthly themes will be drawn from The Cat in the Hat’s Learning Library books. In addition to The Cat in the Hat books, funds will be used to buy supplies to produce and maintain a weekly activity such as a craft, science experiment or learning module. These activities will promote an interactive learning environment so that between 1,000 and 1,250 children and families can learn, read and play together each year. Delivery of Get in the Act’s Science Theater Workshops to all 340 students in grades K-5. Funds will make it possible for “Get in the Act!” science partners to be in the building for two-to-three weeks in order to give every student access to workshops that include topics like Weather, Rock Hounds, the Plant Life Cycle and Force and Motion. The school district does not provide funding for any auxiliary science instruction for grades K-5. Funding for three Family STEM Nights. K-6 students, their parents and siblings will attend fun evenings with engaging stations and interaction that reinforce STEM concepts and foster curiosity, innovation and teamwork. Funds will be used for project coordination, program delivery and a portion of the consumable supplies and snacks used at each event. Approximately 600 students from three local low-income schools will be served by these activities. A Sierra Streams Institute program that will provide experience for three, 3rd through 5th grade classrooms in creating and answering their own research questions. Funds will be used for pre-trip classroom visits, class visits to the Woolman Research site and post-trip creation of posters and letter writing that can be shared with other classes. Students will learn to formulate a testable question, collect data to answer the question and summarize their findings. Knowledge sharing will occur with Clear Creek Elementary School. A Sierra Streams Institute program that provides 2nd through 5th grade classrooms experience studying water quality, riparian plants and aquatic insects. Students will visit a local river where they will rotate through science stations and collect samples to be studied in a microscope lab at the school Funds will be used for instruction, educational materials and teacher curriculum guides. Lastly, $700 in matching funds will be added to the program and knowledge sharing will occur with Chicago Park School. This grant will be for the incorporation of computer coding into the STEM curriculum for K-5th graders. Funds will be used to purchase robot activity sets and puzzles that will be utilized by 240 students in weekly STEM classes. Students will, for example, create a path and then use coding cards to code a robot to navigate the path or play “games” that focus on coding, math or color theory as they enhance critical thinking and problem solving skills. Books and snacks to be used as part of the Book Friends weekly reading club will be covered by this grant. The Book Friend program strives to keep girls intellectually engaged, curious and learning through the summer. The group also visits the local library and closes out the summer with a Literary Lunch. The Friendship Club engages, educates and empowers at-risk girls in a year-round prevention program designed to increase their academic, social and emotional skills. The “Full STEAM Ahead” program promoting art and technology literacy integrated into existing curriculum. Two strategies will be employed. For one, a credentialed art teacher will collaborate with teaching staff. Students will complete lessons on science and in the garden, create models based on Life and Earth Sciences lessons and then create a piece of art using best-practice arts education methods. Students take their artwork home to share their improved understanding of the creative process with family. The second strategy brings challenging technology to students while engaging in imagination, problem solving, creativity and teamwork skills. 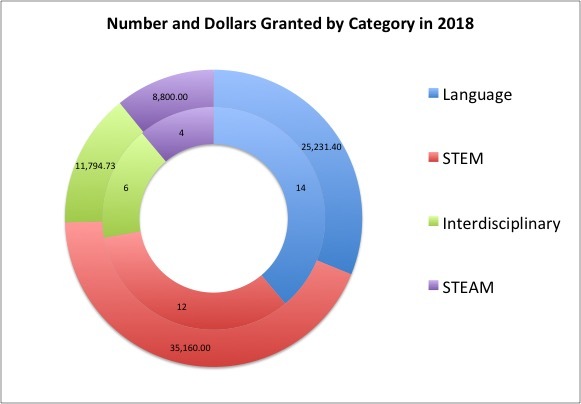 Funds will purchase a variety of STEAM-focused materials to support the robotic lessons, will fund art instruction and materials for art instruction. Lessons will reach all 517 students, as well as a weekly after-school club class. The Family Resource Center will use funds for development of a Family Literacy Garden at the school. Gains have been made in lowering the number of “below grade level” readers in this school, which has a large percentage of economically disadvantaged families and foster youth. This program will focus attention on family education, providing families with access to quality literature, a warm, inviting environment in which to read and information and training on how to effectively work with children to build critical thinking and literacy skills using non-threatening methods. Funds will purchase multi-level fiction and non-fiction titles, a “Free Little Library” will be purchased and installed and pamphlets will be created that talk about how to develop literacy skills. This grant is for journals and writing materials to be used as part of a summer program for 1st through 5th graders. Participants will review the previous year’s reading program and continue reading and writing activities during the summer when children may fall below grade level. The “Parabajitos” programs allows underserved Latino youth to engage in supervised structured activities centered on education, healthy choices and respect for each other and the greater community in which we all live. For a project focusing on increasing awareness of environmental stewardship and reducing the human effect on our ecosystem. Two classes at two schools (four classes total) will receive “on-shore” classroom teaching about the Lake Tahoe ecosystem. This lesson explains how both natural factors and human activities affect the ecosystem of the Lake. A second “on-the-water” lesson for the four classes will allow students to measure Lake clarity, view plankton collected from the Lake using a microscope and perform water quality analysis. The cost per class includes boat use, boat captain and teacher salaries, replacement of supplies, and insurance. Marine Research and Education has no administrative costs (program responsibilities are completed by Board Members without compensation). For after-school programming and providing children 8-17 with exposure to activities teaching fundamental concepts in electrical and hydraulic engineering. Funds will purchase reusable equipment and pay for specialized instructors for ten classes at ten different schools or at out-of-school venues. Students will build Bionic Arms and Banana Pianos and participate in facilitated group discussion. The primary prevention program at Arts-Kids is aimed at reducing substance abuse, suicide, depression, gang involvement and other child/teen tragedies by promoting healthy behaviors. This is a hands-on, real-life simulation program called JA BizTown. It includes approximately 25 hours of prep time in the classroom along with a one-day field trip. Funds will be used for materials, school costs, program support, research and development and evaluation. The STEM initiative at JA BizTown increases student awareness of STEM-related careers and sparks interest in technology at an early age. It also helps students recognize the relationship between what they are learning in school and what they will need to know in the real world. This pilot program will involve fifth grade students at Parley’s Park Elementary School. This is for ten learning sessions of the “Full STEAM Ahead” program. The grant money will purchase science, technology and engineering equipment and cover the costs of speakers for events. Two weeks will be spent on each of the five STEAM areas with the first week featuring community members and the second week offering hands-on activities. Colby is a small community with no YMCA, no recreation league, no after school enrichment programs, and a limited number of summer school mornings. The Colby Community Library (CCL) is the place for children and their families to be in the summer, providing a safe and nurturing environment and great opportunities for learning.